spurgeonblog: One of the greatest physics problems of the age - solved! One of the greatest physics problems of the age - solved! You may have missed this from last month, but one of the most disturbing problems in physics has been solved. 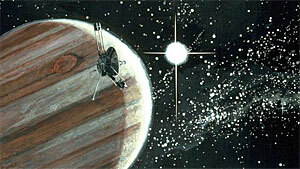 Since the early 1970s, the Pioneer 10 and Pioneer 11 spacecraft have been sailing away from earth. Now they're more than twice as far away as Pluto, and heading out into interstellar space. The problem is, they're heading out just a tiny bit slower than they should be. Astronomers have been precisely monitoring the speed of the Pioneer spacecraft for years. They expected them to slow down slightly (because they are being tugged back ever so slightly by the sun's gravity), but the problem is, they were slowing down too much. The discrepancy was tiny... less than a billionth of a meter per second squared... but it was enough to drive scientists nuts. They looked at all sorts of possible explanations... calculation errors, leaking gas, drag caused by interplanetary dust, you name it. But everything they could think of was eliminated as a possible cause. This led some scientists to even wonder if some of the fundamental laws of the universe might be wrong... maybe the law of gravity, maybe Einstein's equivalence principle. (There's a chapter about the Pioneer anomaly in the book 13 Things That Don't Make Sense: The Most Baffling Scientific Mysteries of Our Time). But last month, they finally figured it out. A precise analysis of the shape of the Pioneer spacecraft shows that heat from the Pioneer's power source bouncing off of the spacecraft's antenna generates a very tiny force, just enough to explain the extra deceleration. This whole thing is a great example of how science is supposed to work... first the observation of some new phenomenon, then the proposal of a hypothesis to explain it, then uncovering evidence that disproves the hypothesis, then another hypothesis proposed and disproved, then another, then another, finally getting to the point where you even question laws of physics that have been in place for hundreds of years. There's a good layman's write-up of the whole thing on the io9 website.